Sikka Rymes - Love Di People. Vinyl EP. Bleep. 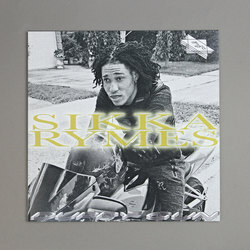 The outstanding Bokeh Versions strike gold once more with an EP from rising Jamaican deejay Sikka Rymes. Love Di People breaks new ground for two reasons - not only is it the first official release from Sikka Rymes after a run of YouTube hits, but this EP also marks the beginning of Bokeh Versions’ partnership with LA label Duppy Gun. The Duppy Gun credo is to pair Jamaican artists with beatmakers from the west coast of the U.S.A., and as such we find Sikka Rymes backed by the futuro-dancehall productions of Genesis Hull here. Hull’s broiling minimal riddims recall Clara! and Swing Ting.